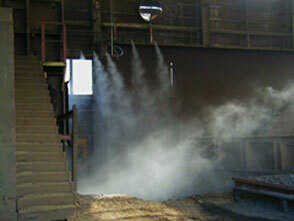 Dust control in factory with Fog - IKEUCHI EUROPE B.V.
Airborne dust particles can cause a range of issues and are difficult to contain, especially in outside environments. 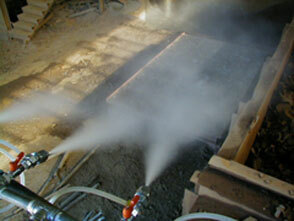 Suppressing or containing dust can be done by either lightly wetting the substance you wish to contain, or by fogging. When suppressing dust via fogging, our humidification systems spray small water droplets the same size as dust particles. These water droplets collide with the dust particles mid air and weigh them to the ground. GSIM series Pneumatic nozzles are capable of dust suppression without significantly wetting the environment by spraying droplet size of 40 – 80 um in large volume swiftly.